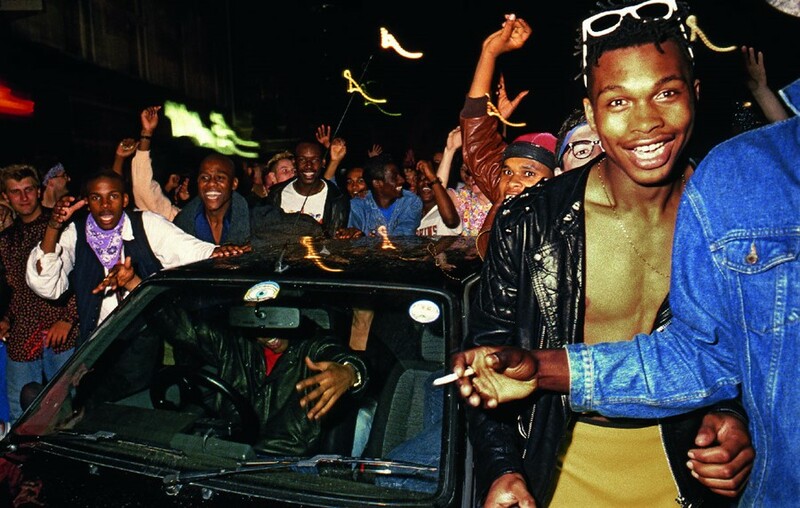 As acid house took control of the UK’s sound systems at the end of the 80s, photojournalist Dave Swindells found himself at the centre of a youth explosion, the impact of which can still be felt on popular culture today. As Strut Records prepares to release This Ain’t Chicago: The Underground Sound of UK House & Acid 1987–1991 this month, Swindells recalls a pivotal night when clubbers took over the streets of central London for a spontaneous rave. “This photo was taken in the middle of Tottenham Court Road at 3.30am on a Sunday morning early in July, 1988. The impromptu street party stopped the traffic for a while. That wasn’t entirely unexpected, as I’d heard there had been a similar party the week before and I was hoping it might happen again. I was there to take pictures for The Observer and this was just what I wanted to photograph. We’d all been in the Trip club at the Astoria until it closed at 3am, and there were maybe two or three hundred clubbers milling about; there was a manic buzz of excitement. I’d not been at a street party where so many people were high on ecstasy and looking to carry on partying. Some were dancing on top of a bus shelter, others were shouting ‘street party!’ and ‘acieed!’ in front of the Dominion Theatre, when these guys drove up with their sound system pumping out at full blast and provided a temporary focus. The carnival atmosphere was partly because nobody could quite believe that they were getting away with it, blocking traffic in the middle of the city in the middle of the night. A few policemen walked slowly up the street towards us, but they were very softly-softly and laid back – maybe they assumed that this was just a crowd of happy drunks! Either way, after five or ten minutes people moved on, doing the ‘shelf-stacker’ dances as they followed the car down into the underground car-park below the YMCA. The chanting and the jacking dance-moves carried on down there, and in the more confined space I got a bit nervous about my cameras. In hindsight that was unnecessary, but it must have been alarming for people coming back to their cars after a night out to find them surrounded by lairy clubbers. Acid house burst upon London in the spring of 1988 and seemed to blow all the other scenes out of the way, acting like an escape into a dance dreamland away from the reality of recession in Thatcher’s Britain. It was the biggest youth movement since punk, partly because it had so much new music from Chicago, Ibiza and the UK being played in a new way, with a readily available new drug and a whole set of clothes, jargon and smiley t-shirts to go with it. In the spring I’d seen all the club promoters at Shoom and heard about their plans to open fresh events: it seemed obvious that it was going to have a massive impact, especially as it appealed to everyone from Chelsea trustafarians to football hooligans. But we didn’t dream then that it would move so fast from random street parties in the first of those ‘summers of love’ to massive orbital raves all over the countryside in 1989.